Mia Fullerton has returned from spending the summer at Little Tykes Theatre, a summer camp for kids. While there Mia discovered her love for the theatre and being on stage. So when the school’s play for the Music Man is announced, Mia decides to apply for a small part. There is just one problem…his name is Tim. Tim is Mia’s ex-boyfriend. He cheated on her while away in Maine. He happens to be helping out as a stage hand on the musical. As if that wasn’t bad enough, Mia also has to see her other ex-boyfriend, Jake. Mia, Jake and Tim are all in the same driving class to get their driver’s license. This is going to be one wild school year. 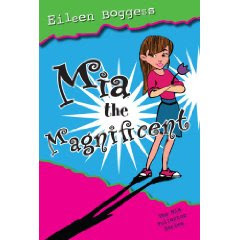 Mia the Magnificent is the latest book in the Mia series by author, Eileen Boggess. This is the first book I have read in this series. There were some events of things that happened in the prior novel, Mia the Melodramatic but despite having not read that book, I still was able to enjoy Mia the Magnificent. Mia and her friends encountered situations like any normal teenager. There were plenty of moments throughout this book where I found myself laughing. This series will have teen readers cheering for more.